"This beef is cooked slowly with Worcestershire sauce, BBQ sauce, and spices. SO EASY! Set it up in the morning and you will have dinner ready when you get home. No mess in your kitchen. Use the sauce over egg noodles or rice." 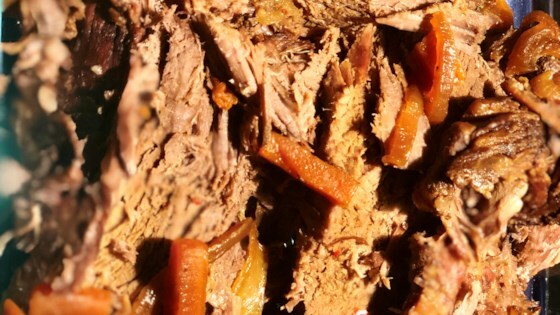 Place beef round roast in slow cooker, then add carrots, onion, and celery. Season with garlic powder and black pepper. Pour Worcestershire and barbeque sauce over meat and vegetables. Cook on Low until the meat is tender, 6 to 8 hours. this was awesome although I substituted A-1 marinade for the BarBQ sauce. Just fell apart at the end of the day and sweet as could be. Served with mashed poatoes and peas. Yum Yum! I loved the flavor of the meat!! However I have to agree with some of the other reviews that the veggies did not taste very well!! I will make it again minus the veggies!! !